Herbert Crosby, fourth assistant to the District Attorney of Saint Lewis, was on his vacation in an attractive area of lakes and pine trees near Brantford. It was so attractive that he decided to rent a cottage in the area as a summer vacation spot for his family. It should be noted that his idea of a cottage has five bedrooms and also bedrooms for 5 servants. He went to the office of Jediah Cook whose rental ads he had seen along the road. Cook never showed up, however, and Crosby found a way to find an attractive lakeside cottage which was being rented by an attractive young woman, Joan Ashleigh. Joan was living with her aunt, Countess Ororsky in the cottage next to the one that Crosby wanted to rent. Joan is an orphan whose parents died in a boating accident. Crosby put down the money for the summer rent on the spot. It turns out that Jediah Cook didn't show up at his office because he died when he and his car went into the lake not far from the site of Crosby's cottage. Local law enforcement in the form of Sheriff Mott showed up to investigate. His conversation seems to be limited to the words "Yeah, sure". Mott seems to suspect Herbert Crosby to be responsible for Cook's death and a great deal of the other happenings in this resort community. Countess Ororsky suspects Russians are involved. Others in the community suspect a Native American named Rain of the crime. The reader will note that there is a great deal of prejudice against Native American in this book. The plot becomes much more involved. A young girl is locked in a closet. Another death occurs. Then there is Tender Teddie who runs a night club which is quite similar to the speakeasy which he ran during prohibition. Tender Teddie is really in prison, but seems to get parole every summer to run his club. Everything seems to be controlled by Benjamin Skeeter who wants to run this community and its residents. Eventually everything is resolved in a rather surprising ending. I cannot say that I recommend this book for serious mystery readers. It is more of a cozy than a hard boiled mystery novel. There is a love story included, and Herbert Crosby tackles all the mysterious happenings with the secure faith in his ability to solve the crimes. Mary Semple Scott (1873 - 1968) was the granddaughter of Illinois senator James Semple, and her brothers made the first electric bus in St. Louis. She was active in the woman's suffrage movement, and was editor of a suffrage magazine. 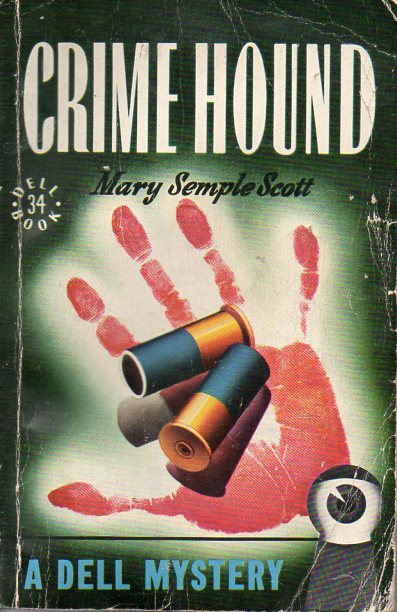 Crime Hound which was published in 1940 was her only mystery novel. 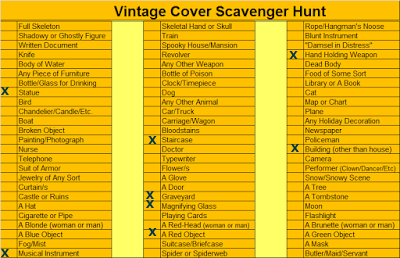 I have read this book for the 2017 Golden Mystery Cover Scavenger Hunt in the category of a book with a hand holding a weapon on the cover. This may be stretching this category a bit but it is a bloody hand print holding two shells which are part of a weapon.